Prince George was the star of the show on his debut royal tour of New Zealand. The Duke and Duchess of Cambridge arrived Down Under today for their three week royal tour. Although the public usually ooh and aah over Kate's latest dress and coat combo, this time all eyes were on Prince George. 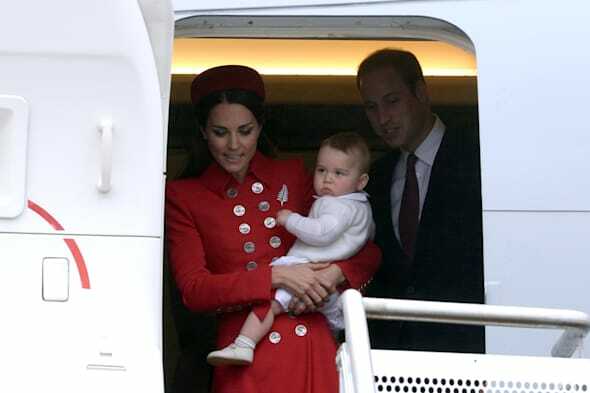 The royal baby looked happy and healthy as he was carried off a Royal New Zealand Air Force (RNZAF) plane in Wellington by his mother and began his life as a working royal. The baby prince faced the world's media for only the second time in his short life - the first occasion was when William and Kate proudly showed off their day-old son outside the London hospital where he was born. 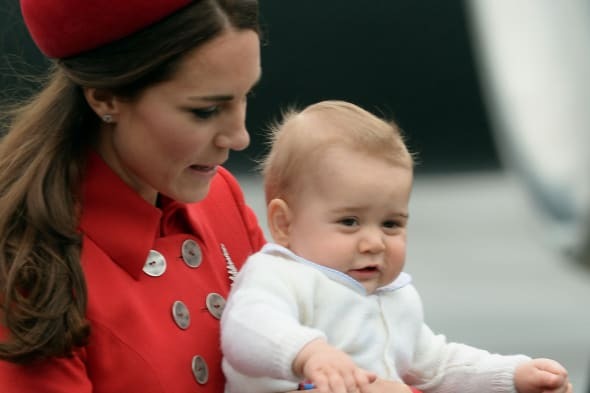 George is only eight months old but he travelled with his parents on a scheduled Qantas flight from Heathrow Airport, via Dubai, to Sydney where they transferred to the military plane. The Cambridges appeared in outfits that each took a coloured theme of red, white or blue - with the Duchess in an eye-catching scarlet coat by designer Catherine Walker and a matching hat by Gina Foster, the Duke looked stylish in a dark blue suit and George wad dressed in a cream cardigan over a white top and shorts. 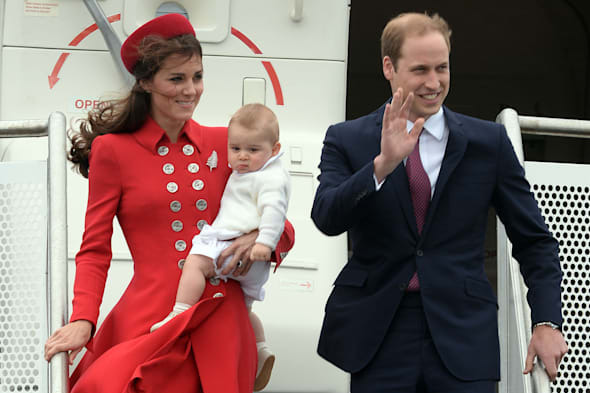 Grey misty clouds and drizzle greeted the royal visitors as they arrived at Wellington International Airport but the eight-month-old prince seemed oblivious to the cold conditions and waved his arms and legs. The royal visit has been greeted with some controversy after parents in New Zealand raised concerns online about the arrangements for the car seat chosen for George by the royal couple. Plunket, New Zealand's national childcare advisory agency, published photos of a Maxi-Cosi baby seat fitted to the official car which will carry George facing forward - but many people said it was going against its own recommendations that a child of George's age should face the rear window. Prime Minister John Key was waiting on the tarmac to greet the royal couple but they received the full splendour of a traditional Maori welcome at nearby Government House, the official resident of the Governor General Sir Jerry Mateparae. Prince William was the first to perform a hongi - a traditional Maori greeting where noses are pressed together and a breath is symbolically exchanged - with two Maori elders and cultural adviser Lewis Moeau and Hiria Hape. Kate, who does not have her husband's experience of the traditional greeting, smiled broadly as she followed suit. On the windswept and rain soaked lawn of the historic building a group of around 35 semi-naked Maoris performed a ceremonial challenge called the wero to determine whether the visitors were friends or foe. Three male toa, or warriors, armed with spears advanced on the royal couple and uttered war cries leaving Kate looking a little startled. They performed an intricate and intimidating series of martial arts moves. before one offered William, 31, a rakau tapu or dart. The Duke crouched down to pick it up, all the while keeping eye contact with the warrior. Kate and William were then officially cleared as "friends" and welcomed onto the main grass area. She later shook hands with one warrior who wore a thong exposing his heavily tattooed bottom and told him she thought the traditional greeting was "super". There was also close attention on George's nanny, Maria Teresa Turrion Borrallo, who was seen officially for the first time as she left the rear of the plane, via steps, with other members of the royal entourage. Wearing a dark jacket, white blouse and grey skirt, she stayed well back from the greetings the couple received on the tarmac. Ms Turrion Borrallo will be looking after George during the 19-day tour that will see the Cambridges travel across New Zealand and Australia celebrating the people, culture and institutions of the Commonwealth countries. William and Kate will be staying in the Wellington area but will not carry out any engagements tomorrow. On Wednesday, they will be joined by George at an event attended by nurses, parents and young children from the Plunket parents' group. At Government House, the baby prince, who is third in line to the throne, is expected to crawl around with a group of similar aged children - six girls and four boys - while the Duke and Duchess chat to their parents who are from a range of backgrounds including a couple of gay fathers. The holiday: Kate and William spent a week at this upmarket Caribbean paradise haven, which enjoys year-round temperatures of 80F. The island became well known for being a popular holiday hotspot for Princess Margaret, and is also a favourite with Mick Jagger, David Bowie, and Elton John. The holiday: Kate and William enjoyed a family getaway when they headed to this exclusive ski resort with Wills' dad Prince Charles. The couple are both a dab-hand at working the slopes, and Kate even showed her cheeky side when she poked William with her ski pole. The royal couple also enjoyed a holiday here in March 2005. The holiday: OK, it was work mixed with pleasure, but Kate Middleton and Prince William returned to the university where they first met for their second royal engagement in February. Although they were officially there for work, the royal couple were also said to have enjoyed the beautiful local countryside, which prides itself in being part of the Green Tourism Scheme. The holiday: Kate showed off her inherent sporty side on a family holiday in the Lake District when she was just four years old. The princess-to-be can be seen getting her hands dirty as she climbed rocks with a look of pure joy on her face. Cute. The holiday: Kate headed to Johannesburg to celebrate the 21st birthday of Richard Branson's son, Sam. The birthday group reportedly headed off on safari, and, unsurprisingly, travelled first class on Virgin Atlantic. The holiday: Kate showed off her amazing bikini body when the royal couple enjoyed some sun, sand and sea action in Ibiza in 2006, where they were spotted soaking up the sun on a luxury yacht. The holiday: Ski fanatics Kate and William enjoyed the powder at France's celebrity-favourite resort, Courchevel, in 2010. The pair, who were on holiday with friends and family, including Kate's sister Pippa, were spotted enjoying a 'loving' meal at a moutain-top restaurant. The holiday: Want to know where Prince William popped the question? The couple were on a luxurious safari holiday in Kenya, where they stayed at the stunning Cheli & Peacock's Lewa Safari Camp situated in the Lewa Conservancy. The camp has 12 sumptuous tents, which cone with ensuite bathrooms, and a swimming pool overlooking the plains. Very romantic. The holiday: Where do you go if you're dating a royal a fancy a weekend of hunting? Your father-in-law-to-be's fabulous country retreat in Scotland, of course. The royal couple spent New Year here in 2009, and regularly enjoy weekend visits to this beautiful hideaway. The holiday: It was a pretty long holiday... well, two and a half years to be precise! Kate's family moved to Jordan when she was two, and they lived there until she was four and a half. Kate even attended nursery in Amman. Aww.